Hawthorne, The Ozark Angler, and I had the pleasure last Friday of guiding David and his two sons, Christopher and Connor during spring break for the boys. We started the day on the White River on a very cool, misty and rainy morning. The water conditions were very poor due to all the rain of the previous few days. Regardless, Connor, who was in Tom’s boat for the morning, managed a really nice slot limit Brown Trout on one of Bo’s Missouri River high water worm patterns. As water conditions continued to get worse we decided on an early shore lunch and and a new plan for the afternoon fly fishing. The water on the Norfork had been turned off so we made the short trip over to the Fork. We parked at the dam site and took off wading down river. Because the Sowbug Roundup fly fishing show was in Mountain Home, Ar, this weekend there were really a lot wade fishermen on the Fork. We waded around and found a really nice seam with several big moss beds and some actively feeding trout. For a couple of hours all of the boys managed to catch some nice Rainbows and ole Dad, David, hooked up a really big Brown Trout on a #16 Born’s Hairy Legged Sowbug but could not seal the deal. 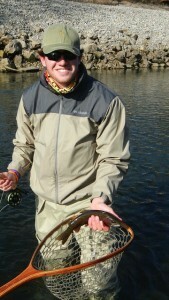 Regardless, a bit later he managed to get this beautiful Rainbow with a kyped jaw to the net. 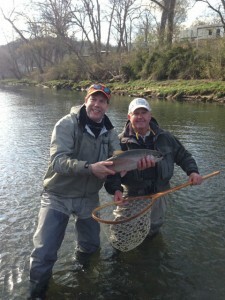 Just goes to show you that even in difficult conditions you can keep moving and working and find some nice fish. All the boys had a good time on the Fork and they will definitely be back to fish with us. 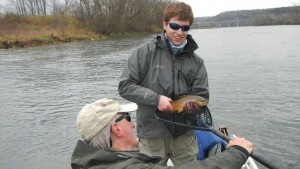 A special thanks to Tom Hawthorne and The Ozark Angler for including us on this guide trip with this wonderful family!